A slash-proof backpack, an alarmed laptop case and a pub chair with space to hide your handbag inside are among the creations of a research centre fighting crime with design. The Design Against Crime centre devises innovative gadgets and adapts everyday items to make theft as difficult as possible. Based at London fashion college Central Saint Martins, the centre has devised enough items to make James Bond and Batman envious since its inception in 1999. Its latest invention - an M-shaped cycle stand which aims to reduce bike theft - will be used by councils nationwide from Thursday. "Our crime-proof designs make products more sustainable," says centre director Lorraine Gamman. "They become harder to steal so we don't need to keep replacing them." Take its "karrysafe" bag, which emits a deafening scream if pulled from the shoulders, forcing the thief to abandon it seconds later. Or the centre's anti-theft chair, with space inside its seat for a handbag. "It encourages you to literally sit on your valuables," says Professor Gamman. The team works with police and criminologists, and interviews thieves at length, to identify shortcomings in existing product design. "I always thought design should be more about ethics than aesthetics," says Professor Gamman, whose PhD studied the impact of shoplifting. "At the end of the 90s many designers were preoccupied with playfulness and colour. Everything started to look the same. "I realised that the world had lots of other issues that needed to be addressed, such as climate change and criminality." The centre's lingerie "stealth belts", which store valuables out of sight, were put on sale along with anti-theft record bags for DJs and alarmed laptop cases. 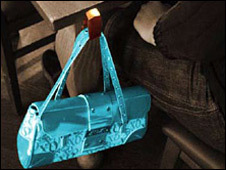 Its bag-holding clips, which fit under pub tables and prevent bags being easily unhooked and snatched, are currently being tested at a Wetherspoon pub in Holborn, central London. 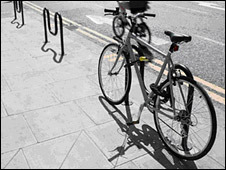 The latest Design Against Crime idea to go public is the M-shaped cycle stand, the shape of which makes it easier to lock both wheels and frame to the stand and harder for thieves to remove it. Tested over two years in Camden, north London, and Brighton, the "caMden" stand has now been adopted by councils nationwide. Adam Thorpe, who headed the team which designed the stand, said: "At the start of the project we saw thousands of people locking just the top tube of their bikes onto stands, which make them easy to steal. "The shape of our stand makes it obvious that the whole bike needs to be secured. It should encourage more people to cycle, safe in the knowledge that their bikes will still be there upon their return." Mayor of London Boris Johnson welcomed the stand as "a great example of the type of innovative solution to crime that can be made reality given the right support". Professor Gamman believes manufacturers are slowly recognising the benefit of anti-theft design. The centre's next secret project is described only as a "low-tech solution to mobile phone theft". "I personally would like to design a phone that blows up when someone steals it," says Professor Gamman. "That would be one way to stop thieves using it."